Apply as a spot treatment to cracks and crevices and/or harborages, where evidence of bed bugs occurs, including bed frames, box springs, inside empty dressers, furniture and clothes, closets, carpet edges, high and low wall moldings, behind headboards, pictures, wallpaper edges and luggage. 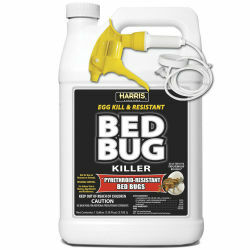 Spray bed bugs directly when possible. Do not make surface applications to mattresses or bedding. Mattress treatments must be limited to seams, folds and edges only. Do not treat pillows, bedding or clothing. Spray surfaces from a distance of 8 to 10 inches until slightly damp and allow to dry thoroughly before using or replacing bedding.